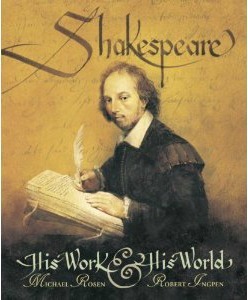 This book was read for the Shakespeare Challenge. Wow. I wasn’t expecting a children’s non-fiction book about Shakespeare to be so good! This book doesn’t just cover his life but also his work, what his plays are about, what made him write them and what makes them so good and so popular today. Here are the chapter headings: A Plot!, What’s So Special About Shakespeare?, Extraordinary and Dangerous Times, Shakespeare: The Facts Stratford and School, London, Theatre in the Making, The New Theatres, Shakespeare at Work, The Drama of Shakespeare, The Will, The Legacy, Timeline. I really liked the explanations of bits of text from Shakespeare’s books. I always had a hard time understanding how he wrote and the books explanations were very helpful. I also learned what most of the plays are about which I didn’t know but always wondered. The whole layout of the book is awesome too. I love the beautiful illustrations. Robert Ingpen even did a few double page spreads.